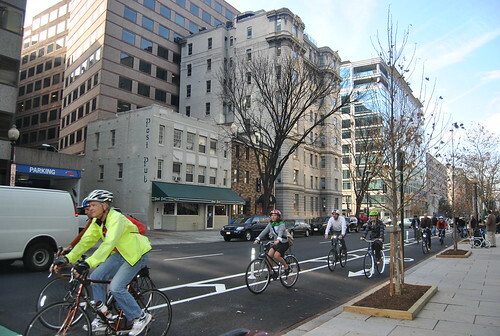 War on cars continues: bike lane takes 0.2% of parking! Also, calendar note: the JITI Urban Transportation Seminar on February 6 will feature speakers from Tokyo Metro and Tokyu Corporation. Tokyu is notable for being one of the more profitable commuter rail + real estate + retail conglomerates in metro Tokyo. This entry was posted in bicycling biotically, car berater. Bookmark the permalink. If you weigh the loss of car parking against the increased number of people the L Street cycletrack serves, if you consider the number of single occupant vehicles and the fact that a parked car is just sitting there most of the day, the complaint about loss of parking along L Street is ridiculous. When they’re available, I’d love to see stats about the usage of the new L Street cycletrack – I bet it’s more than the 150 spaces removed. I would love to go to a Japanese urban transportation seminar.